That’s my sequence. Now I can lay out my sequence on rectangles of different proportions; they don’t have to be exactly 21 squares in area, though they can be. Imagine that the white squares are knit and the black squares are purled (they could be anything, but that’s an easy substitution. Now, cast on seven stitches in the round and work the sequence above; it will fill three rounds perfectly, as shown below. Alternately, cast on six stitches; it won’t quite fill four rounds. This is where I depart from the regular form of sequence knitting, which would continue to fill the space (the code would stop working if I did that). 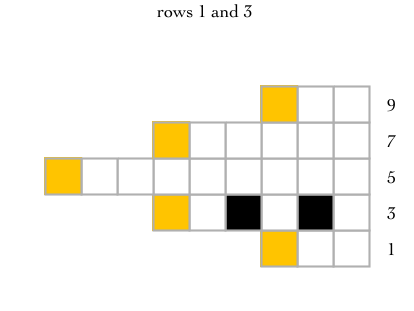 In the four row version, there are three extra spaces at the end of the fourth row. They don’t matter for the purposes of the code; there’s no black square following them, so we don’t have to count them. Now, it turns out that the pieces don’t have to be cut into equal lengths. I first realized this with Beloved, which is also tiled diamonds, though I didn’t explain it in detail at the time. I did introduce an added complication at that point; I wanted to outline the diamonds to help define the code more clearly since it’s not a rectangle. I’m not entirely sure this is necessary, or even helpful. Still, it’s how I’ve done things so far; what do you think? 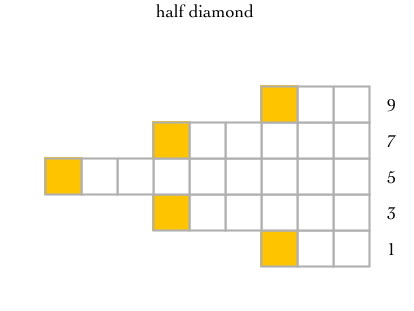 The end squares of each row of diamond are marked in orange. I don’t place a black marker in those squares. They act as margins between the diamonds. Here’s the blank diamond I started with. Because I like symmetry, I cut the diamond in half before putting the sky sequence into it. So, keep in mind that I treated the orange squares as being off limits. Here’s the long row of sky, just as a reminder. There are 2 squares available on row 1. 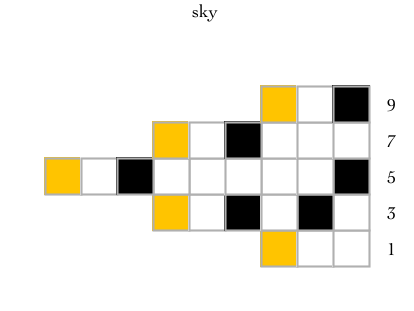 The first two squares of sky are blank, so no black squares will go on row 1, and squares 1 and 2 are now accounted for. There are 5 squares available on row 3 (I’ve hidden the alternate rows because those will be plain knitting), so the contents of squares 3 through 7 will go on row 3. 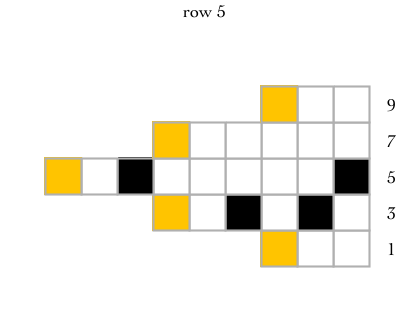 There are 8 squares available on row 5, so the contents of squares 8 through 15 are placed there. There are 5 squares on row 7, so squares 16-20 go there. And finally, there are 2 squares on row 9, so square number 21 goes there, with one square left over in the diamond. All of the sky sequence has been placed on this half diamond. Here it is, mirrored, making the diamond to be tiled. Here’s the diamond tiled in a crescent shawl, with the orange boundary squares still present. And with the orange squares removed. 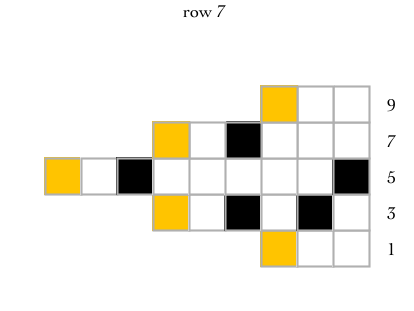 To turn this into an actual stitch pattern, the knitter would need to work out what kind of stitch was represented by the black squares and then work the knitting accordingly. When I design lace, each black square is replaced by a yarnover, and then I figure out where to place the decreases and any decorative stitches. < crescent shawls: tiling flattened diamonds.